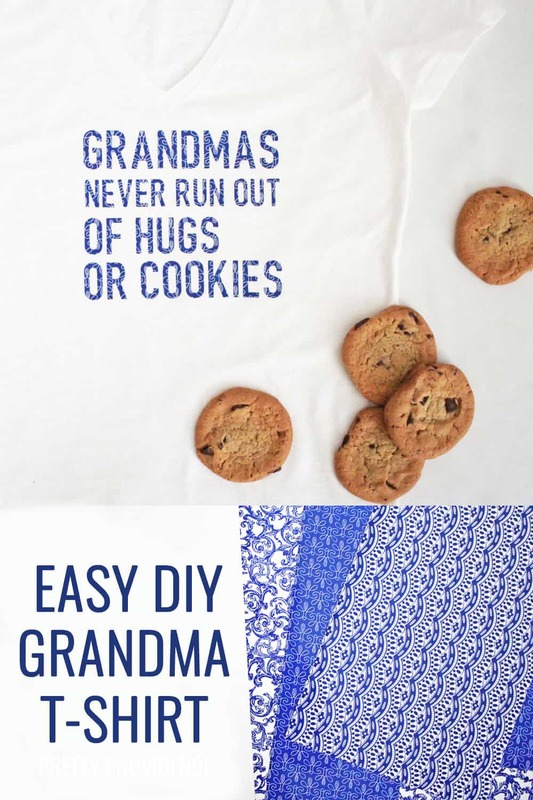 This DIY Grandma T-Shirt is the perfect gift for Mother’s Day! 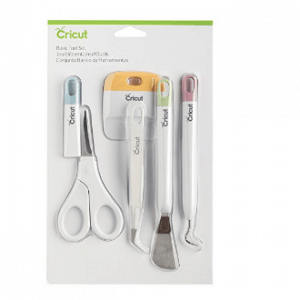 This is a sponsored by Cricut. As always, all opinions are my own! 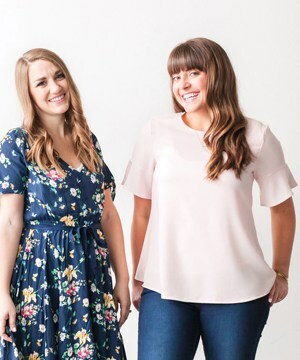 You guys, I am so excited to share this fun Grandma mother’s day gift idea with you today! I’ve been wanting to make some fun Grandma shirts for a while now. 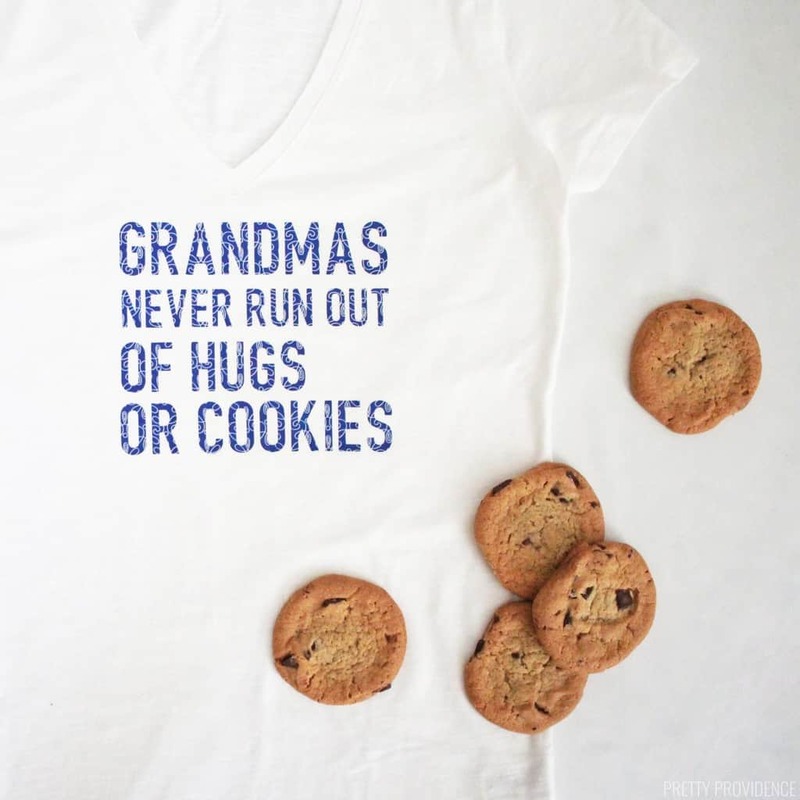 I went back and forth with what to put on a t-shirt for our Grandma, but ultimately, I decided to go with the playful ‘Grandmas Never Run Out of Hugs or Cookies.‘ It’s true… in many cases they seem to always have cookies or cookie dough in their freezer, and grandkids love it! When Cricut came out with this beautiful new Patterned Iron On™ I knew that this was meant to be on a t-shirt. A lot of the patterns are so pretty and feminine. This stuff is a game changer, you know I love my black and white graphic tees, but this makes it so easy to add dimension to a shirt! 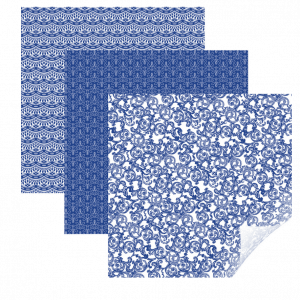 My favorites are their Blue Filigree (shown here) In Bloom, and the Party Time Pastels. If you want to make this Grandma t-shirt (or your own version of it with another color or pattern of Iron On, just click the link below to use my design. 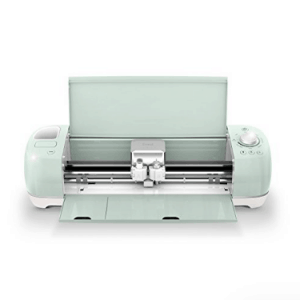 It’s waiting in the Cricut Design Space for you! 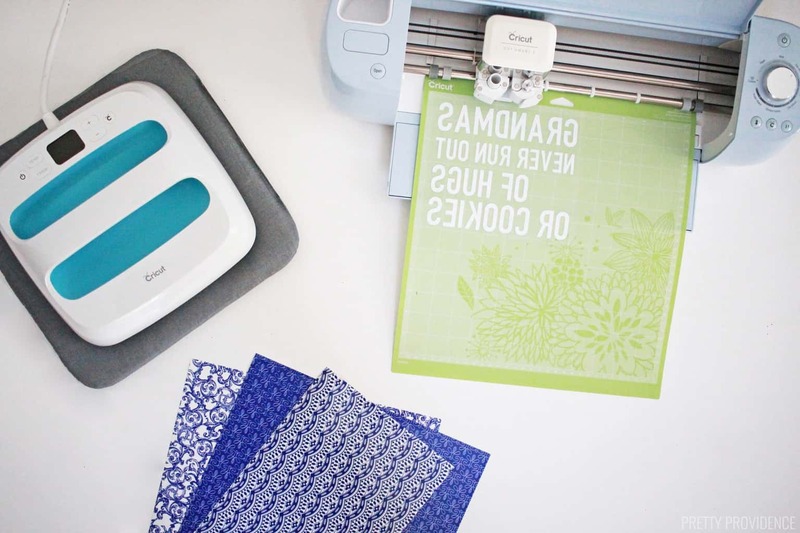 Load your mat into the Cricut and pull up the design in Cricut Design Space. Turn on your heat press and set to 340 degrees Fahrenheit. Make sure you have the machine set to Iron On and set to mirror on. Put the plain t-shirt on top of your EasyPress mat. 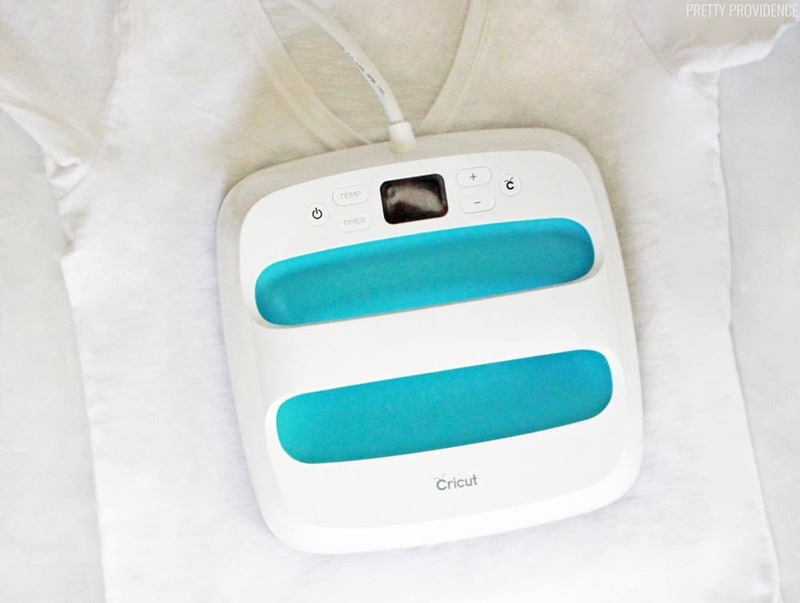 Press the EasyPress onto shirt to preheat it for 5 seconds. Carefully place the Iron On design onto the t-shirt. Place the EasyPress on design for 50 seconds. Wait for the Iron On to be warm (not all the way cool) and then peel diagonally. 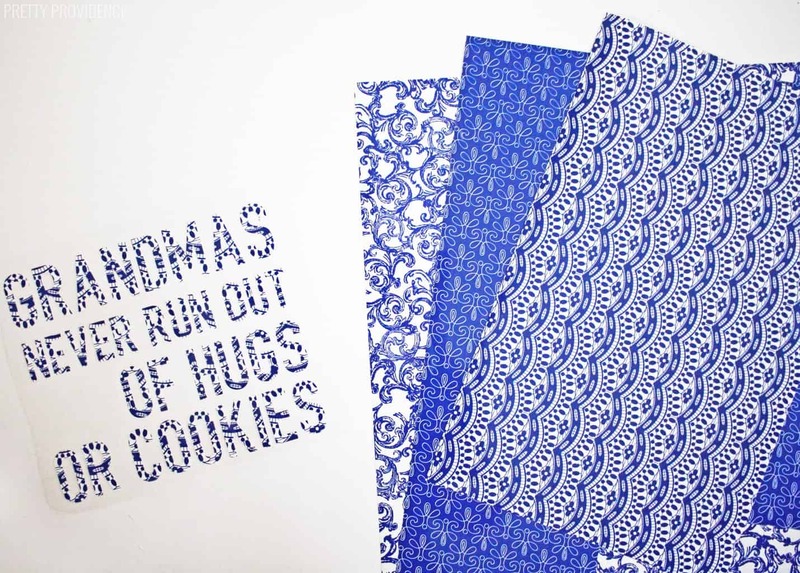 Do you need an EasyPress to use Patterned Iron On? 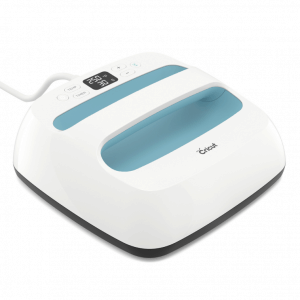 I think if you do a lot of Iron On projects, you need one! You can use a regular iron to press the Patterned Iron On onto a t-shirt, but the EasyPress is absolutely worth it for how much time I save now! It really is SO easy to use and I love that it takes 30 seconds to set your design with it. If you don’t have one yet, just follow the instructions here. I tried cutting the phrase out with the chantilly pattern at first, but at least on my white t-shirt and with that many words, it was kind of hard to read. I think it would be great for one big word on a shirt, though. After that, I decided to go with the more solid blue pattern and I love it. The great thing about the samplers, is that since they come in packages with 3 different designs, they’re perfect to layer together or mix and match. I’m thinking that soon I’ll use the other two blue patterns to make shirts for my girls. 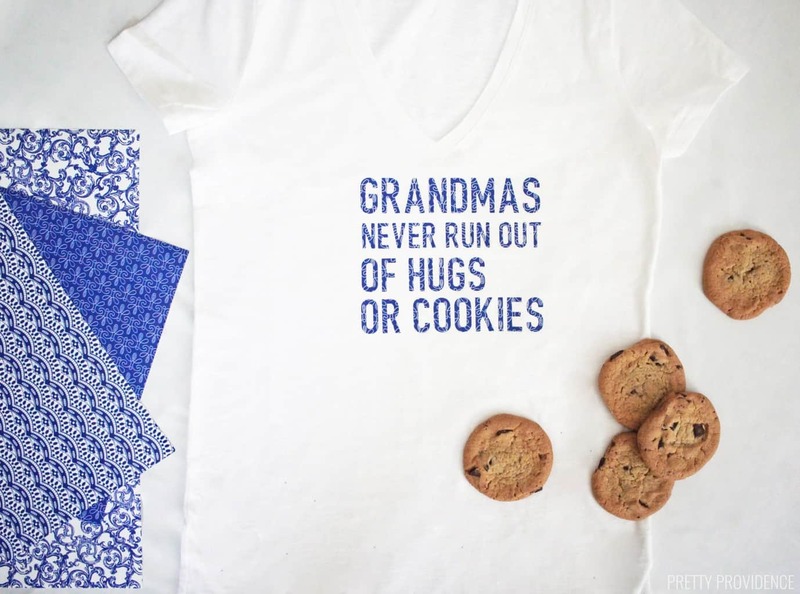 How cute would that be for Grandma to coordinate with her grand babies!? and you might also like this sweet & personal teacher gift idea!